This 18-week marathon program is designed for injury-free runners who have run at least one marathon in the last three years and are looking to nail a brand-new PR. This plan isn’t for the faint at heart; some days, you will definitely need to dig deep and shovel in some badass #motherrunner grit to get it done, but when you do, you will be rewarded on race day with legs that are crazy strong and able to tackle the distance with a vigor that surprises you. CROSS TRAINING + STRENGTH TRAINING INCLUDED? One weekly workout is your choice: cross training or a rest day. 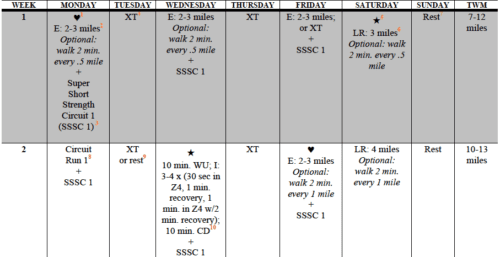 There are SSSC’s (super short strength circuits) three times weekly, as well as a pre-hab routine Coach Amanda designed. You don’t need anything but your body weight for all strength training. Not seeing your wave? Here are the registration dates and waves for upcoming Marathon Program. If your wave has already passed, please email us and we can work it out. A mother-runner-friendly training plan. This 18-week marathon plan is designed for injury-free runners who have run at least one marathon in the last three years and are looking to nail a brand-new PR. This plan isn’t for the faint at heart; some days, you will definitely need to dig deep and shovel in some badass #motherrunner grit to get it done, but when you do, you will be rewarded on race day with legs that are crazy strong and able to tackle the distance with a vigor that surprises you. To CRUSH THE DISTANCE—and the training for it—mother runners should have at least one marathon in the past three years under their belts. In addition, it is essential to enter this plan with a solid base—long runs begin at 10 miles—and an injury free body. If that isn’t you, consider 26.2: GO THE DISTANCE. LONGEST LONG RUN DISTANCES: Three 20-milers, one 18 miler, and two 16’ers. If that feels like too much for your running experience or your schedule, consider 26.2: GO THE DISTANCE. No. The fee is for the comprehensive training plan, unlimited support, miles of resources, exclusive podcasts, and swag package, which will help you nail your marathon, both physically and mentally. At the end of the wave, you will participate in the organized marathon of your choice; you can also choose to run a marathon on your own, if that works better for you. We still have you covered. Here are the registration dates and waves for upcoming Marathon Programs.